Some robots do something useful, like ordnance disposal. Some robots do something artistic, like music. Some are more interactive. And some robots are just danged cool. Balancing is not necessarily difficult to achieve (although it looks amazing); the trickiest part was in getting the cube to jump up from a resting position to a balancing position, since it releases a burst of energy to do so, and needed to be kept stable. The solution was to use momentum wheels, which are the same kind of flywheel used for altitude control in spacecraft. These momentum wheels were then also used to help the cube balance by using the reaction torques’ acceleration and deceleration. 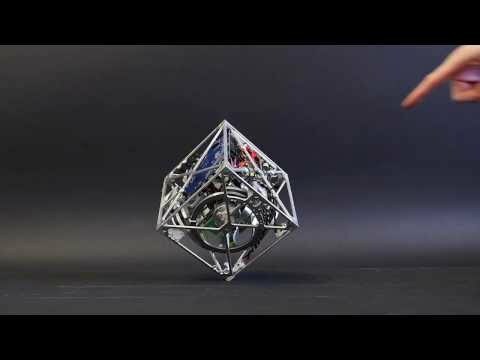 The resulting robot is able to jump from a resting position to balancing on an edge, then a corner; and it can “walk” by jumping up, balacinging on an edge and falling onto another side of the cube, effectively rolling along. It’s really cool stuff, and we’d love to have one of our own just to play with.